WALLACE STERLING 2010 SONGS OF CHRISTMAS ORNAMENT 11TH EDITION Annual sterling silver ornament from Wallace Silversmiths is made in USA. 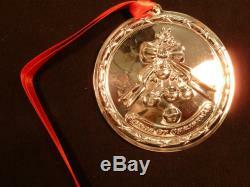 It shows a festive scene with'Carol of the Bells' embossed on this lovely keepsake. Disc is 3 in diameter. 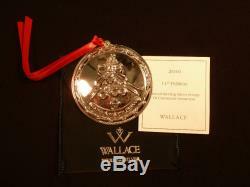 The item "NIB WALLACE STERLING SILVER. 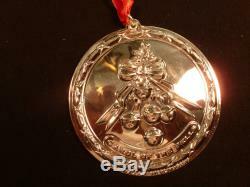 925 2010 SONGS OF CHRISTMAS ORNAMENT 11TH EDITION" is in sale since Saturday, August 20, 2011. This item is in the category "Collectibles\Holiday & Seasonal\Christmas\ Current (1991-Now)\Ornaments\Other Current Tree Ornaments". The seller is "dcridder" and is located in Hampstead, North Carolina.